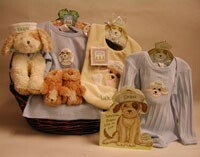 From Bunnies By The Bay, we have chosen Skipit Pup character to make this basket one to treasure for time to come. Any little boy would fall in love with this soft and cuddly pup. This wicker basket contains the following: -Skipit Stuffed Pup made with the softest tan cuddle fur. -Skipit "Why does Skipit like to Lick?" Cardboard book -Skipit Bunsie 0-12 months. Blue 100% cotton bunsie has snap closure, puppy face applique. -Skipit Salty Pup T-Shirt 12-18 months. 100% cotton with long sleeves. -Skipit velour bib with Velcro closure and pockets features an adorable applique of puppy. -Skipit furry slippers.